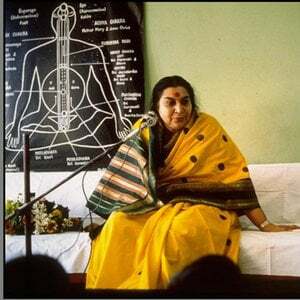 In these modern times – that Shree Mataji calls as the Blossom Times because of the state achieved by human consciousness collectively – she has devised a method by which this happening (Self Realization) is achieved spontaneously (Sahaja), without any effort. A little light is then lit within us (a new dimension becomes available to our awareness) and through Sahaja Yoga meditation we can then grow much faster, without having to go through any penances, while living normal lives amidst our own families and societies. One becomes peaceful and joyous in life. One becomes collective as a drop falling into the ocean of compassion. This method works for the multitudes and not individually. Of course one cannot pay for the experience of Divine Love. Moreover, it is the last breakthrough of our evolution. This is the actualization of such transformation, which is taking place now, worldwide, and has been proved and experienced by hundreds of thousands in over 120 countries. This inner awakening is called by many names: Self Realization, Second Birth, Enlightenment, Liberation, Moksha, Satori and it is the goal of all religions and spiritual traditions of the world. This knowledge is ancient, but for a long time it was available only to a few souls, being kept secret and transmitted from guru to disciple, since Self Realization was extremely difficult to achieve. In these modern times, through Sahaja (“spontaneous”) Yoga (“union with one’s Self”), this experience has become effortless and available to everyone, for the first time in the history of human spirituality. It is our subtle body which co-ordinates all the work done by the organs and the cells in our body. An effective type of meditation allows us to attack the causes directly, by re balancing our subtle system and by cleaning our centers/chakras. Thus, even so-called incurable illnesses can be cured in a spontaneous manner by the purifying work of the energy of the Kundalini. When we enter a state of meditation, we enter a realm of silence; the thoughts which assail us fade away, and the reality of the present is revealed to us in all its intensity. Our senses send us a direct image of the world which is not altered by our mind or our conditioning. When the Kundalini is awakened and we are immersed in a state of meditation, our emotions are also brought into balance. All the weaknesses which hinder the expression of pure and sincere sentiments, such as greed, insecurity, jealousy etc. are reduced when the joy of meditation is felt. This joy is absolute, devoid of all duality and becomes the motivation of our emancipation. Especially Sahaja Yoga Meditation reveals to us the eternal, divine being that is truth, awareness and bliss. We become part and parcel of the whole, like a drop in that ocean of love, and in meditation we melt into that Primordial being. This experience is the next stage in the evolution of an ordinary human being’s awareness: that person is said to be born again or realized. This means that our spiritual essence, that had been hidden until then, becomes reality. Our union with the whole will become stronger and stronger as we go along and that is without doubt the most precious benefit that Kundalini awakening can bring us. This middle way that is established within us day after day by our kundalini will shower blessings of all sorts upon us, not only of a physical, emotional or psychological nature, but also material, social and professional benefits. Regular practice makes you better and much peaceful from inside. That’s the beauty of Sahaja Yoga you can be into thoughtless awareness state in almost every situation and anywhere. Yogis from all walks of life come together and meditate together and enjoy the divine bliss together. We have our centers all across the globe so you can enjoy meditating in collectivity everywhere. Gradually after regular practice you will observe that you become a much more peaceful and compassionate personality. Everything has logical and scientific reason for all our activities and all of them are very natural and comfortable for everyone. Each individual is allowed to meditate and introspect themselves at their own pace and not pressurized to cope up with other. All our centres across entire Mumbai are absolutely free !